Perfect time to trim a hedge - Crowe Tree Service Inc. The green space on your property, including your trees, supports and shrubs, make a living space that is simple on the eyes and enjoyable for some great summer gatherings. Studies show that homes with a lot of green space close-by give a psychological boost to members of your home. Plants create a pleasurable space to have some fun and the benefits are greater than just the visual appeal. Ensure you trim your hedges at the best time to guarantee that your green space remains flawless and beautiful for all to enjoy. Before having your hedges trimmed in Ottawa, it is important to know the kind of plant that you have on your property. Our professional hedge trimmers in Ottawa will be able to take care of your hedges for you however if you are venturing out on your own, make sure you know which type of hedge you are dealing with. Deciduous hedges, which tend to shed amid the cool season, require diverse pruning patterns compared to evergreen fences, which keep up their foliage all year long. Additionally, trimming relies upon the sort of pruning that you need to perform. Formative pruning, which makes the particular shape that you need to hedge to frame, is not quite the same as upkeep pruning, which disposes of excess development and branches. ideally as the season approaches before the winter months. Formative pruning for your evergreen hedges should be done in the spring after planting. Formative pruning for deciduous hedges should be done similarly, but the pruning should be completed during the inter instead. The pruning that you have done for your hedges may follow general guidelines based on the type of hedge that is being maintained, however different species respond better to trimming and pruning that is carried out more frequently and others respond better to a few trims only during the growing season. Furthermore, there are some species of cedar hedges that should have their flowers trimmed as soon as they start the flowering process. One important note is that you should avoid pruning or trimming your cedar hedges during the nesting season of birds because the cedar maintenance may actually damage bird nests and/or scare off some birds. 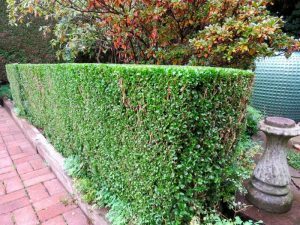 Maintaining your cedar hedges is something that you can tackle yourself if you have the time and are a real DIY person however there are many benefits to hiring professional cedar hedge pruning and trimming companies to ensure that your cedar hedge investment is protected and your yard stays beautiful and healthy. We have been trimming and pruning cedar hedges for a long time and our experience shows. Give us a call for affordable, reliable, and timely cedar hedge trimming and pruning in Ottawa. How Much Will It Cost To Prune and Trim Your Hedges?